Wilhelmina Designs is an online webstore with luxurious interior accessories. The assortment consists of, among others, clocks, side tables, mirrors, lighting and wall decoration. Their products differentiate themselves through their high-quality finish and stylish designs. In addition to the webstore Wilhelmina Designs supports interior projects for offices, hotels, yachts and recreational parks. Wilhelmina Designs wish was to cross the border and start selling in Germany. To do so it was necessary to first translate their entire assortment into German. 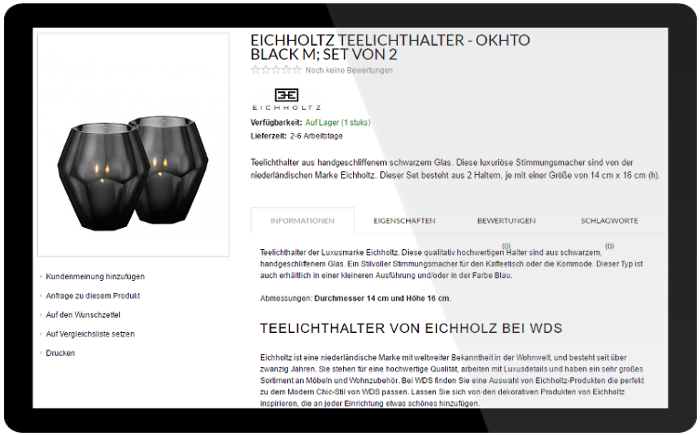 Because the organisation wished to professionally profile themselves in the German market from the start, their main objective was to have their product descriptions indexed positively by search engines. The proper incorporation of SEO keywords in the translated texts was therefore essential. ”We wanted our webstore translated into German. Through my Lightspeed back-end I was able to download the Simply Translate app in a heartbeat. After connecting my webstore, the products were able to be translated straight away by recognised translators. I could even pass them my SEO keywords! Because Wilhelmina Designs was already a customer of Lightspeed, it was possible for them to download the Simply Translate App for free. This app gave Wilhelmina Designs direct access to our translation platform. With help of the platform the organisation could make a selections of the articles that they wanted to have translated. Because they attached a lot of value to SEO optimised texts, we consciously chose to assign experienced eCommerce translators to the project. They translated the text with a commercial eye and correctly incorporated the SEO keywords into the texts. After Wilhelmina Designs approved the translations, they were uploaded to their website with one click of the mouse. Because all products were translated each with their own goal, the organisation was professionally represented in the German market from the start. The texts were indexed positively by search engines, guiding traffic to their website. Do you own an eCommerce website? Are you looking to translate your product descriptions effortlessly without having to copy-paste? Use our innovative translation platform or talk to us about the possibilities.